A term I have often come across while volunteering for African Initiatives is Sustainable Development Goals (SDGs). Many of African Initiatives’ strategic aims align with these goals, and so I wanted to write a blog that explores SDGs in further detail and looks at exactly how African Initiatives, through its programmes and five-year Strategic Plan (2017-22), is working towards achieving them. In 2015, all United Nations (UN) member states adopted the – 2030 Agenda for Sustainable Development– a plan of action aimed at eradicating poverty and securing a more peaceful, prosperous world. Included in this agenda were 17 SDGs; the ‘blueprint’ for achieving a better and more sustainable future for all. These goals specifically target challenges facing individuals in the twenty-first century such as poverty, inequality, climate change, environmental degradation, economic growth, prosperity, peace and justice. The SDGs have elaborated on the Millennium Development Goals (MDGs) which came to an end in 2015. Building on these, a new target date has been set for 2030, by which time the UN has pledged to end ‘poverty and hunger everywhere’ through the SDGs. 617 youth worldwide lack basic mathematics and literacy skills. By 2030, the goal is to ensure that all youth achieve literacy and numeracy, and to increase the supply of qualified teachers through international cooperation for teacher training in developing countries. Only 13% of women globally are agricultural land holders, and only 52% of women who are married make their own decisions about sexual relations. By 2030, the aim is to end all forms of discrimination against women and girls everywhere, and eliminate harmful practices such as female genital mutilation. In order to make SDGs a reality, the UN has established the Division for Sustainable Development Goals within its Department of Economic and Social Affairs. More than this, though, the UN relies on NGOs such as African Initiatives, as well as corporations and governments to globally implement practices that align with the SDGs, and to spread awareness about the importance of achieving the goals. African Initiatives has worked hard to embed its five-year strategic plan (2017-22) within the priorities of the SDGs. Focussing on education, health and well-being, and livelihoods and resilience, our projects are designed to achieve SDGs through the overarching emphasis on community engagement and female empowerment. In our strategic plan, we identify the role that the charity plays in achieving the SDGs. While volunteering at African Initiatives, I have found the Equal Rights to Quality Education project (ERP) particularly inspiring and relatable to the SDG ethos. This project specifically relates to Goal 4 (achieving quality education) and Goal 5 (gender equality), in my opinion, achieving these in Ngorongoro, Monduli, Longido, Karatu, Mbulu and Kilolo districts, northern Tanzania. As explained in the UN’s outline of the SDGs; a quality education forms the foundation to creating sustainable development, being incredibly important in helping locals in poor countries to break out of the poverty cycle. Poorly trained teachers, a lack of resources in schools and poor infrastructure all have a detrimental effect on the quality of education in the rural north of Tanzania. Gender equality, similarly, is a necessary condition for a peaceful and prosperous world. By providing girls with equal access to education, political representation and health care, economies are fuelled and the social development of a country is developed. Tanzania is a country where the government is struggling to provide good quality education for the 8 million children who attend school every year. Additionally, traditional practices in pastoralist communities such as early and forced marriage and female genital mutilation greatly affect the ability of girls to attend and remain in school. Our project addresses these issues by providing teacher training, creating health clubs through which students can learn about female genital mutilation and sexual reproductive health, and improving access to education by working with teachers, parents, and community leaders to sensitise communities on the importance of education, especially for girls. By June 2019, when the project comes to an end, we hope to have empowered nearly 8,000 primary and secondary school students to learn about their right to education. Naishooki Saduru is a primary school student from Monduli district and upon hearing her story, I realised how important it is that charities such as African Initiatives continue towards SDG goals. 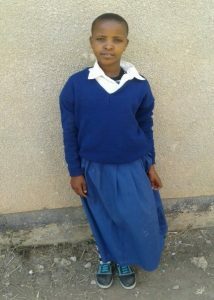 Naishooki is one of the many girls who are victim to the negative effects of gender inequality. Living in a compound with her father, his three wives and sixteen children, she is one of the 750 million young women worldwide who are married off before the age of 18. After attending a health club run at her school as part of our project, Naishooki was taught about the importance of girls’ education and has been given the confidence to stand up for her rights. She refused to be married, and was empowered to study hard at school to reach her goals. Blog written by Jessica Louise, volunteer Communications Officer.